Original paintings—as well as the plentiful pencil drawings that lead up to them—are a staple of the talks. Part of de-mystifying the book making process is to make it accessible and, above all, real. My school visits are exciting, all day affairs, comprised of back-to-back small group sessions, with presentations to individual grades in a library or media center setting. It has been my observation that the world we offer to children is full of reproductions and vicarious experiences. Books, by nature, feature reproductions, and Powerpoint presentations—while a practical solution in many situations—run the risk of substituting one reproduction for another. 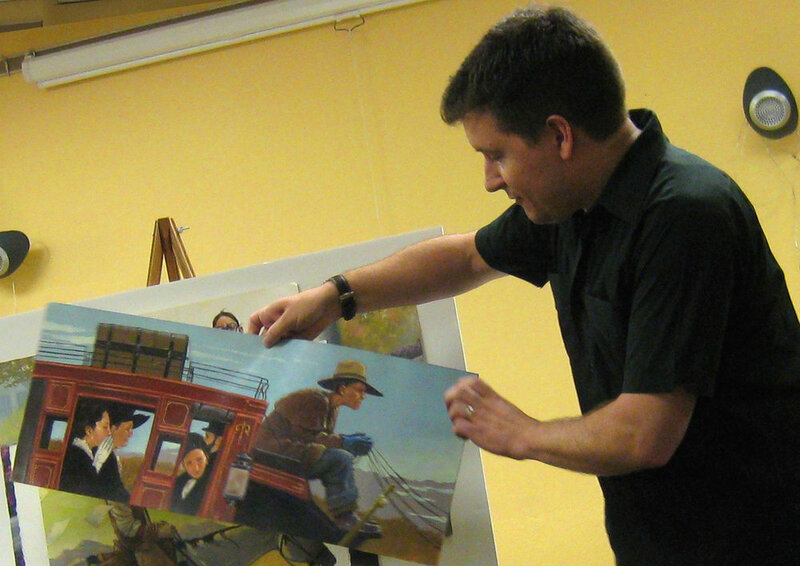 In order to peel away the magic tricks that comprise a finished book, my talks are full of original art, which is tossed around and waved about, propped up on easels, and discussed with funny age appropriate anecdotes. Your students will see every stage of a book's production laid out, from the earliest pencil scribbles to full scale paintings. They'll even get a peak into the industry that produces their favorite books: how stories are selected, how artists are hired, and just how long it takes before this whole hodgepodge of effort makes it to their shelves. This most likely has to do with proper rein-holding technique for a six horse stagecoach, and possibly about the stage coach driver's view of the horse. This is an "artist" talk, so we'll be talking about making illustrations for books. We can select a title to focus on in advance; my historical fiction portfolio ranges from California mining towns to Teddy Roosevelt's Washington, DC, as well as Passover in the era of the Civil War, the earliest days of baseball, and the biography of a 19th century transgender stagecoach driver. There's always a new release to talk about, too, and plenty of titles that are really just fun. Regardless, the process is the same: lots of research, lots of thinking, lots of drawing, lots of painting. Speaking at the Young Readers Conference in Fort Hays, Kansas, 2014. Of course, if you want a Powerpoint, I am happy to oblige; sometimes this really is the most practical solution. For these, I'll arrive prepared to talk about the process and profession of illustration in general, with stories and examples of different genres of books I've worked on. We'll discuss similarities and differences between projects and publishers, drawings and paintings, and still walk through the book making process from the earliest "thumbnails" to the final paintings. In the following Q and A session, I'll answer any question asked, and don't worry, if I'm asked how much I get paid for a book, we'll still talk about math, and decimals, and percentages, and estimated print runs... it'll still be fun! And of course, I'm still happy to cart along original art to wave around, prop up on an easel, and answer questions about. Contact me at adam@adamgustavson.com, and we'll figure out a program that's best suited to your school or event.